Leave it to Wolfgang Puck, one of the world’s foremost chefs, to put his name on and endorse a revolutionary cooking oven. The Wolfgang Puck Pressure Oven uses a pressure seal to keep heat and moisture from escaping, thereby cooking food up to 70% faster than a conventional oven. That type of speed is in the microwave realm, with the main difference being that food in this oven will crisp up and not become soggy. The Puck Pressure Oven is marketed as an oven that works a lot like a pressure cooker. In many ways that is correct, but true pressure that builds up in the oven is far lower than a pressure cooker. However, pressure cooking really is the secret to its success. Although you can use it as a conventional counter top oven, by cooking under pressure you are truly using it the way it is meant to be used. There is a pressure valve at the top, and a lever that seals the oven tight. As the pressure builds, some of it will bleed off because this is a low pressure unit, but still, enough pressure is contained so that there is even heating through and through. The biggest advantage is that most of the moisture remains inside. That makes cooking steaks, roasts, chicken, and whatever else easy without having to continuously baste the the food to keep it moist. That means the food is self basting because whatever is being cooked doesn’t dry out, which gives it a moist and hearty taste every time you use it. Don’t worry about your roasts and grilled food becoming a pale soggy mess either because its five functions let you brown the outside just like in a regular convection oven. And if you only want to use it like a proper oven you can switch to the Standard Mode but still be energy efficient. However, if you think you want your oven to behave only like an oven and do its job well, here are our picks for top rated toaster ovens. This 1.0 cubic ft (29L) oven can cook a 14 pound turkey or a 12 inch pizza. Even though this is a fairly revolutionary design it is very easy to cook with. There are 5 main pre-sets, including bake, roast, broil, toast and warm. Once the selection is dialed in, you set the temperature, set the time to cook and let it go. The included recipe book is very informative and gives you cooking times for the weight of your food, as well as the correct temperature. You also get a Roasting Pan, Broil Rack, Drip/Bake Pan, Crumb Tray, and User Guide. Once the food is prepared and inserted into the oven, close the door and lower the seal in lever. The vent release valve should then be set in the sealed position and you turn the timer on with the selected function. When the food is done, the timer will sound, you release the pressure, unseal the door and take the food out. That’s really all there is to it. The oven case and insides are made of steel which makes this design very durable. There is a large push-to-open door button for easy opening when your food is cooked and done. There are 3 selector dials that make it work. A timer dial, a function selection dial and a temperature dial. They are easy to grasp and turn. The inside is non-stick, so if there aren’t too many splatters, it is damp wipe cleaning capable. You will need to follow the instruction book and recipe guide, especially if you are using the pressure cooking mode. Everything is covered there but as always with cooking appliances, you may have to tweak the time and temp to get everything perfect. If you can, place the oven near a range hood or open window, as once the pressure starts to release, steam will vent almost continuously so it’s good for it to have an immediate outlet. Easy to use dials that won’t scare you away. Nothing digital here, so even a novice will be able to figure out how it works. The included recipe and instruction book are easy to read and understand. The non-stick inner coating is easy to clean. Microwave fast in pressure cooking mode for larger dishes. It is expensive for what you get but it also makes cooking easy to do. The steel case is not well insulated and can cause burns if touched during cooking. Always keep hot pads on hand and never allow kids to get near the unit when its turned on. It slides easily around on countertops. While this isn’t necessarily a bad thing, it can be difficult to keep in one place when you want to release the pressure lever. To release the steam from the valve after cooking, you’ll need a hot pad or insulated mitt to keep from getting burned by the hot escaping steam. You must use an elevated cooking grate or a pan that allows grease to drain. If not, your food will be cooking in its own fat, and that is not a particularly healthy way to cook. With the price notwithstanding, the Wolfgang Puck Pressure Oven is actually a very fine and useful cooking machine. You may have to get used to some of the features and quirks, and always keep hot pads and mitts available, but for what it is capable of it’s hard to beat. You might even consider getting rid of your microwave if you get good results with just this one appliance. Its small size will never replace a full sized oven, so realistically, it is best suited for a couple or a small family. That’s not a knock, but the reality is that keeping an oven under pressure is a lot easier to do in a smaller size. Plus, a smaller size takes less energy to cook with, which is another advantage to using an oven like this. 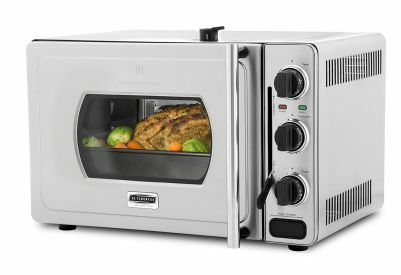 If you love cooking gadgets, want to save time, effort and energy, and if you have the needed counter space that is available, you will be pleased to call the Wolfgang Puck Pressure Oven your own.